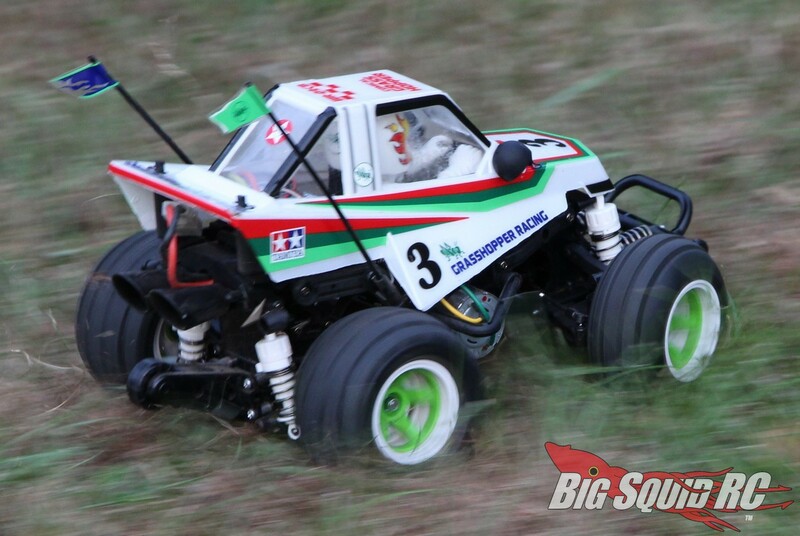 Tamiya Comical Grasshopper WR-02CB Review « Big Squid RC – RC Car and Truck News, Reviews, Videos, and More! Primary Competition: Ummmmmm ya, there aren’t a whole lot of vehicles in the “1/10 Comical Anything” category at all. At least not yet! 🙂 With the sales numbers this little buggy is going to have, you gotta expect more in the future. What’s Needed To Complete: This version of the Comical Grasshopper comes as a kit (a pre-built version has since been announced) so you’ll need the typical build tools, paint, a steering servo, as well as radio gear. Tamiya supplies a brushed motor and a speedo along with the kit. Build Quality: Hey, this thing is a kit, so the build quality is 100% up to you! We will put here that our build went well with no major issues or hitches. Yes, we feel that even a first time hobbyist can build the Comical Grasshopper. Test Drivers: Hawaiian Chris, Tom, Brian, T-$$$, and yours truly. 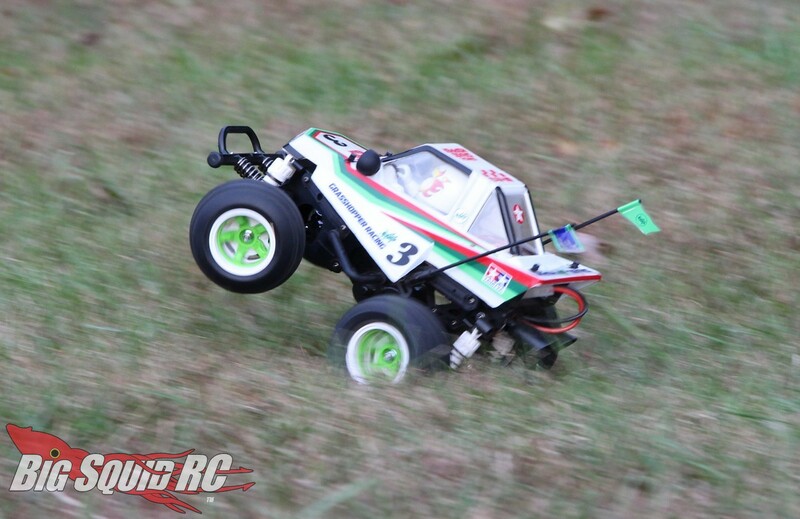 Test Venues: Our Comical Grasshopper was treated to various parking lots, backyards, and even took part in our big-air demonstration at the 2018 Rocky Mountain Hobby Expo. 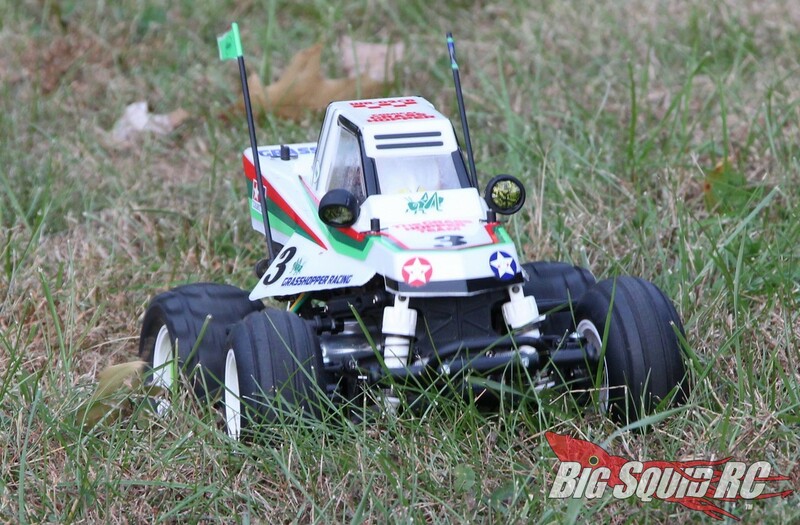 Set-up Notes: We tested the Tamiya with radio gear from Horizon Hobby and a NiMH battery pack from RC4WD. Driving: So everyone wants to know just how bad the Comical Grasshopper drives. We mean, just look at it, it doesn’t look like it could possibly drive well could it? Well, it can. Sure, every time you stab the throttle hard the front wheel rise, which then negates any attempt at steering. On the bright side, any time you aren’t pounding the gas it drove quite well. Yes, the buggy has some bounce to it from its soft suspension and foam-insert-less tires, but it just seemed to “work” for a buggy that looks the way it does. 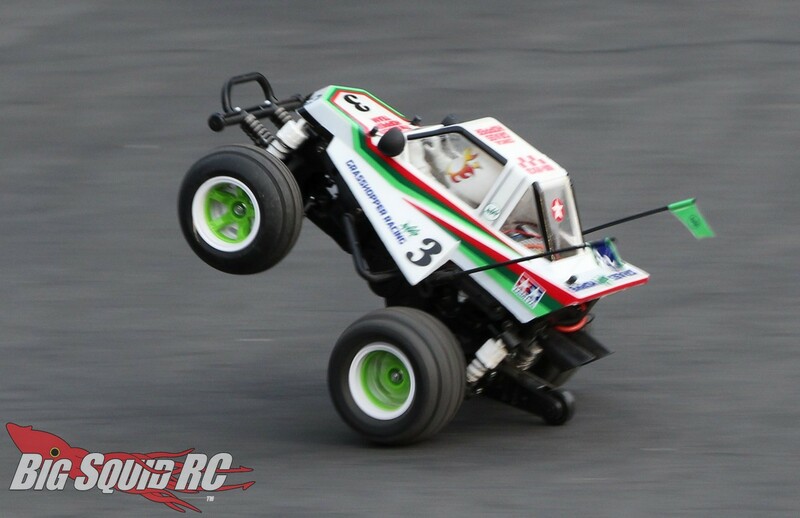 When you enter a corner and come off the gas the front wheels stick and stay planted until you hit the gas again. Over rough ground the buggy had a lot of bounce, but that seemed to add to the fun. With the Comical Grasshopper you aren’t going out and trying to win an IFMAR world championship, you are simply looking for some huge smiles. 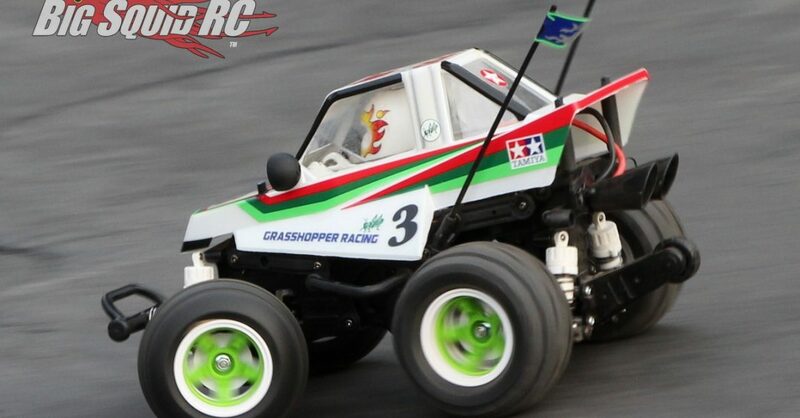 We found that Comical Grasshopper was super easy to drive, and it really was fun to drive around. Pulling wheelies with it was ALWAYS a smile inducer, then hitting jumps way bigger than it was ever built to make was even more fun. Yes, pretty much everyone fought over the controller, not for its performance driving characteristics, but more for the way it made our 40-something year old media hearts feel like they were ten again. Tires: OK, so they have no foam inside, but seem to work fine given their application. Would we put some foam inside? Probably not, the unexpected spin outs in corners and ultra-bouncy jump landings just add to the fun with this style of vehicle. Power: There isn’t a lot of power on tap with the Comical Grasshopper. We feel it is about perfect for the first time hobbyist, but our experienced crew wanted just a tad bit more yank. 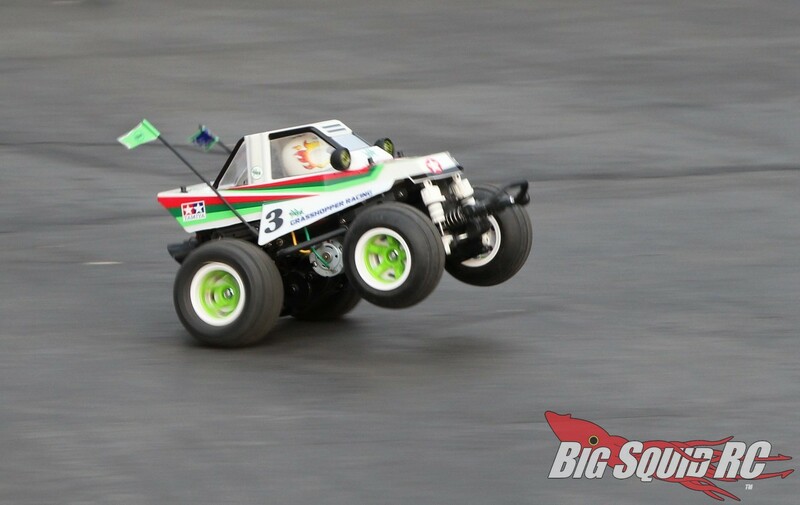 Stock, the Tamiya could easily pop its front tires off the ground from a dead stop, but could not hold the wheelie very far. Our Bash Crew would probably upgrade to a legit LiPo for more wheelie power, as well as looking for a bit more power with taller gearing. Broken Parts: Initially we thought it probably wouldn’t take much to break the old school design on the Tamiya, but boy were we wrong! 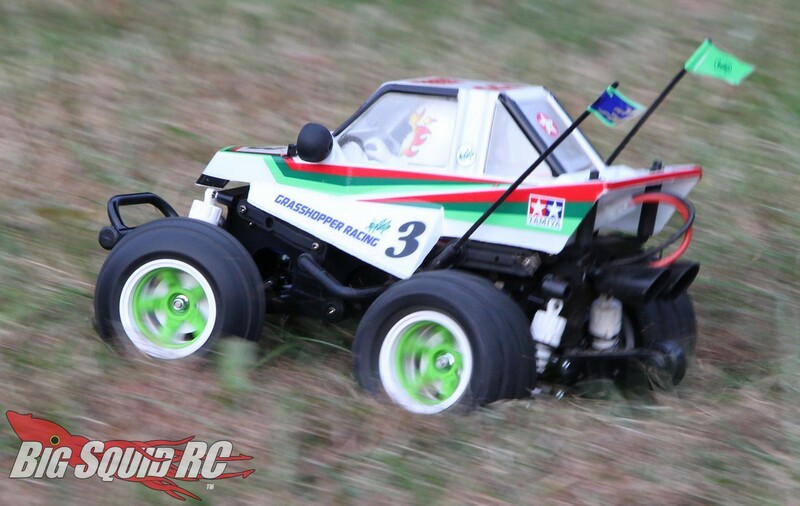 The low top speed on the Comical Grasshopper keeps it from breaking parts, as does its huge spring loaded front bumper, while a large wheelie bar and plastic exhaust help to protect the rear. In the end, while several parts are cracked or tweaked, our test machine is still running! And that is with us relentless beating on it (including slamming it with an ARRMA Typhon a half dozen times) at the trade show in Denver. From what we have seen, it is extremely difficult to break the Comical Grasshopper with its stock power system. People at the Rocky Mountain Hobby Expo just loved the look of the Comical Grasshopper. We had a ton of people come to our booth just to look at it. 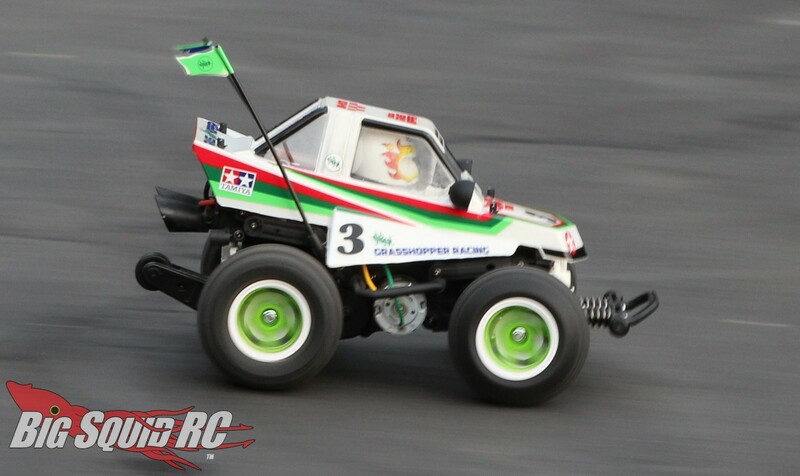 Oh and, every kid that saw it, just HAD to drive it, which is good news for the future of the hobby. 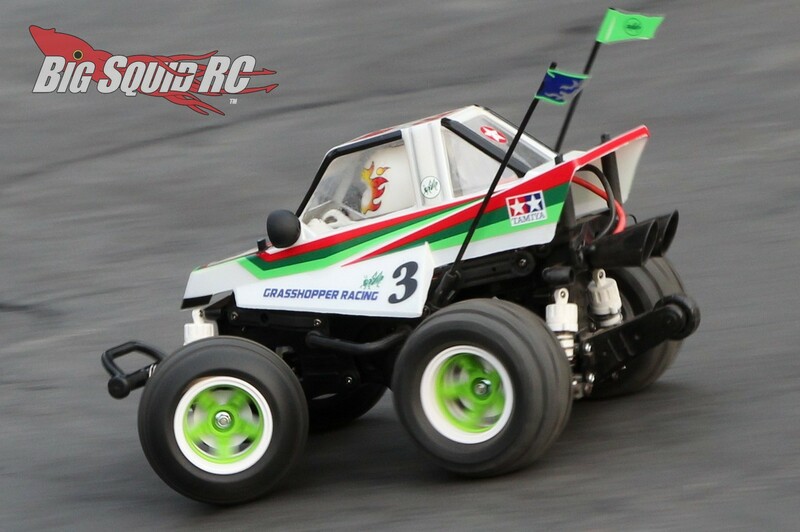 Best Mod: The BigSquidRC Bash Crew would pop in a 17.5 brushless motor, along with a LiPo, to give it more wheelie holding power. 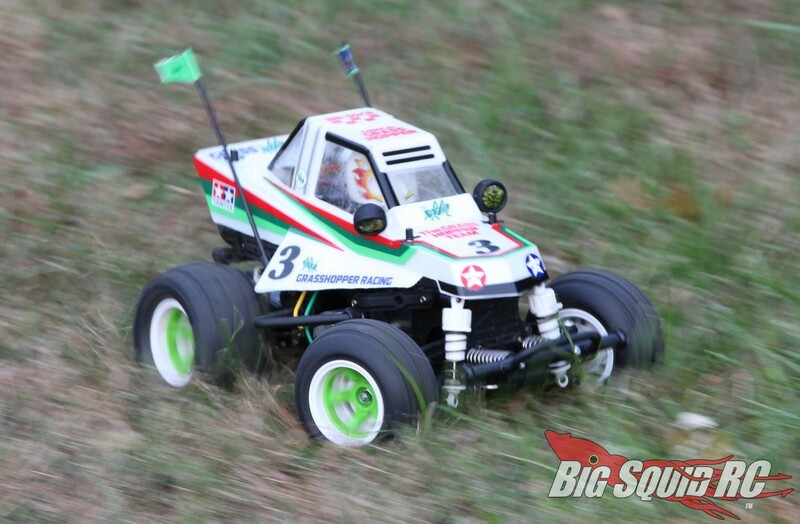 Time To Bash: C While kits take a lot longer than a RTR to get going, the Comical Grasshopper was a quick build. Workability: C Phillips screws, along with the tight confines of the short wheelbase do make it a tad more difficult to work on than other buggies. Thankfully you will rarely need to work on it. Car Show Rating: A Oh ya, if the Comical Grasshopper can pull people in at a big trade show, it can turn heads at your local park. Bash-A-Bility: A A freak’n tank. We mean seriously, we beat it like it owed us money and it is still driving today. Fun Factor: A The Comical Grasshopper arguably brought more smiles to our faces while driving than anything else we’ve tested. Handling: D OK, so its handling suits it comical demeanor. 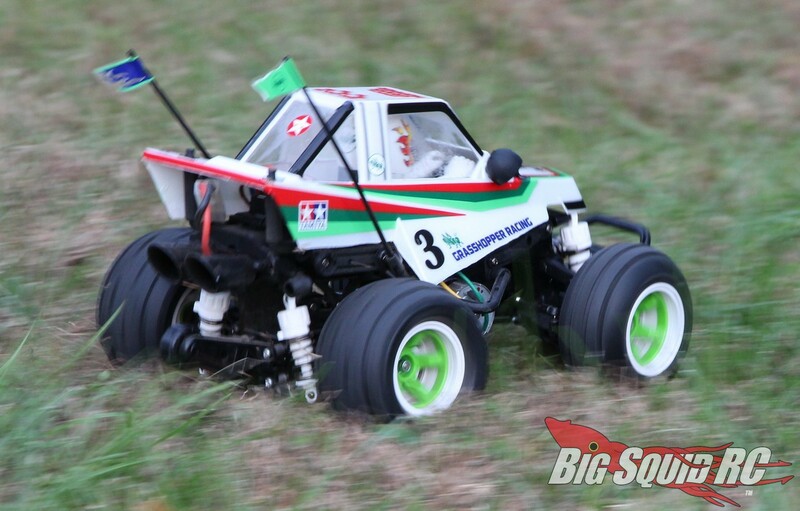 However, if you had to race one at your local track, you would find it bouncing all over the place compared to a typical 1/10 race buggy. Value: A We found the Tamiya to be an outstanding value, good luck to you finding one off the first shipment. Parts Availability: N/A The Comical Grasshopper has yet to hit the market, therefore we can’t judge parts support at this time. 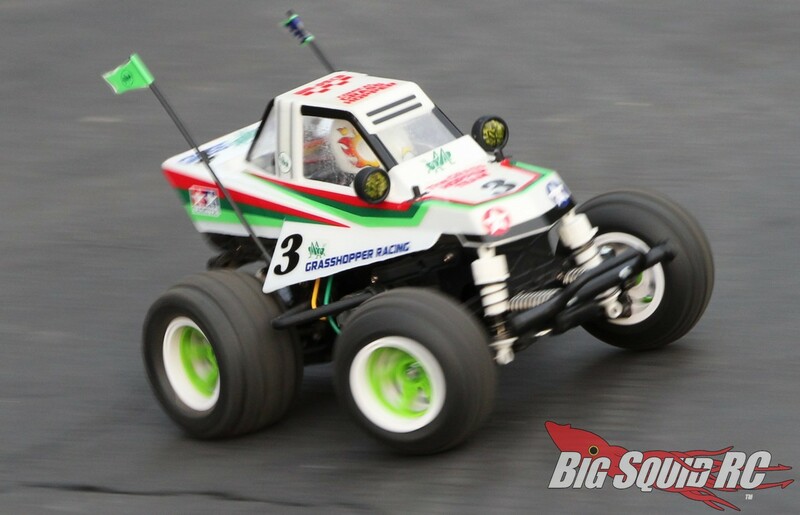 BigSquid Rating: B While the final score shows a “B”, the Tamiya Comical Grasshopper is truly something special. The Comical Grasshopper is a fun new take on a legendary classic, and it comes in “old school” kit form. We had an outrageously fun time while doing our review, get your hands on one so you can too!